My journey doing stuff with photo stitching started out when I came across Microsoft’s Image Composite Editor (ICE) software. I’d seen ‘small planet’ projections, thought they looked like fun, so downloaded the software to see if I could make a small planet. I stuck my GR on a small tripod using a ball head and rattled off some pics in the park. Churned them through ICE. And the results were really pretty good. And there’s the start of a slippery slope; ‘pretty good’ was certainly encouraging… but not good enough. 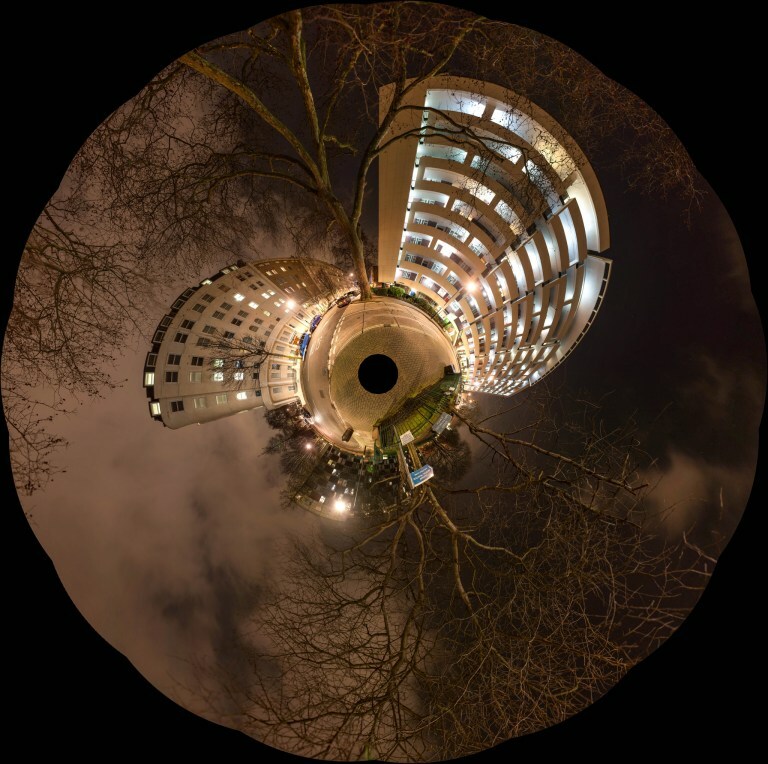 So… here’s what I’ve learned about stereographic projections (and other composite images). Take lots of pictures then join them up to make a single picture using stitching software like ICE. If you keep the camera in one place and rotate it around the right point (see ‘The tricky bit’ below) the pictures join up seamlessly. You could take several pics of something in front of you to get a wider-angled picture of the something. 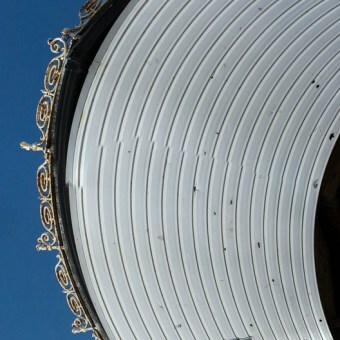 Here are 4 pictures joined together to give a wide-angled view of a beautiful Worcester landmark. They overlap by about 30%, and I cropped the end result to get the framing I wanted. 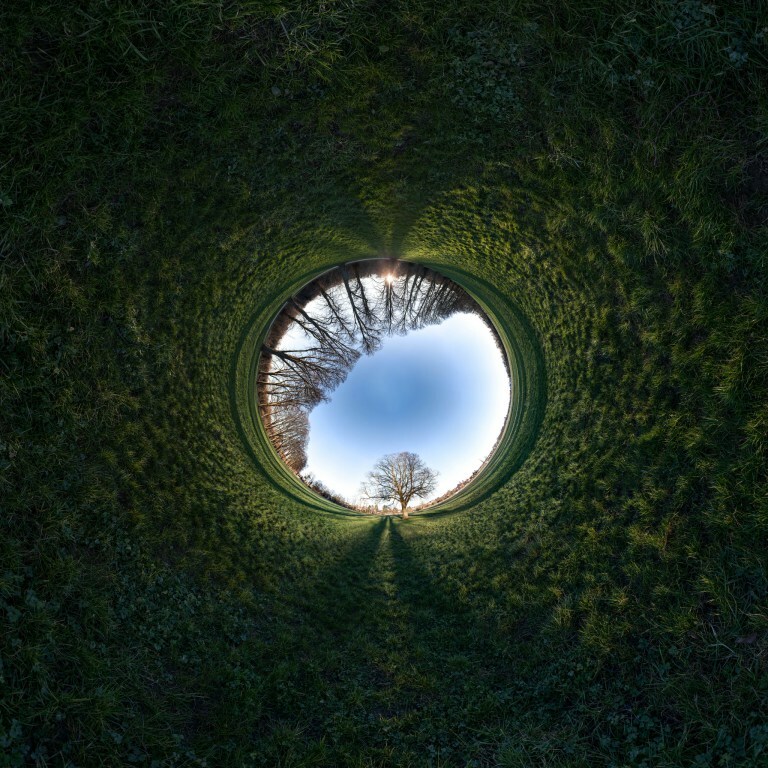 More interestingly you can take 360 degrees’ worth of images (the wider your lens, the fewer pictures you will need) and then you’ve got a panorama that will show what’s in-front of and behind you as though it is a single picture. You can take several rows of pictures so that you cover a wide angle vertically as well as horizontally. Here are 72 pictures (4 rows of 18) taken with a 50mm lens. The rows were taken at 45, 15, -15 and -45 degrees on the vertical axis. The columns are every 20 degrees horizontally for 360 degrees. 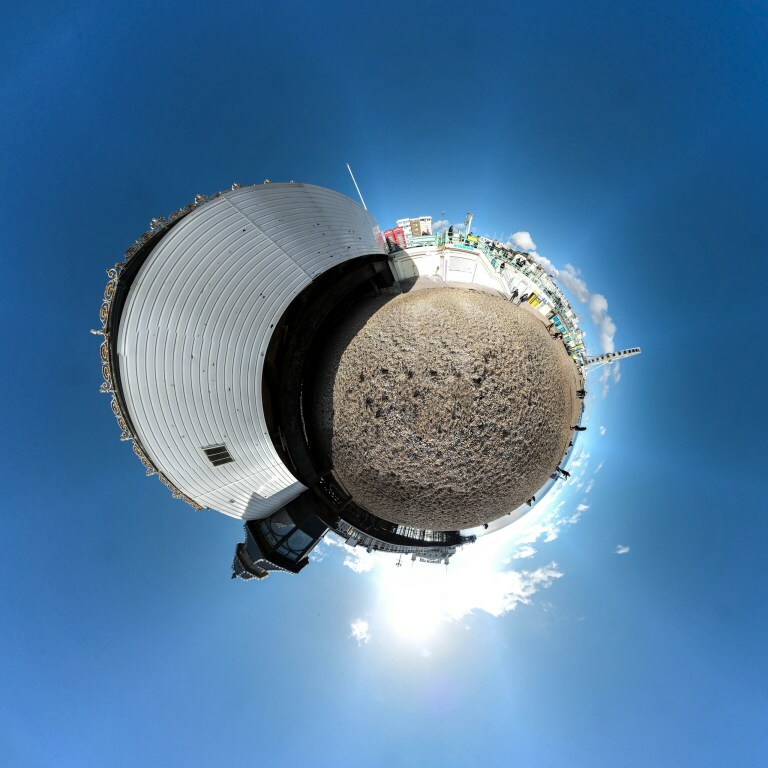 This is what you get when you join the pictures together using ICE (and recenter the result); a 360 degree landscape photograph. Or you can pull the sides upwards and together, joining the horizon to make a tunnel. I didn’t take rows that covered directly above or below (below would be full of tripod anyway), so I’ve used ICE’s ‘auto complete’ to fill in the gaps that would normally be at the centres of the pictures. I’ve cropped out the edges of the images, which would be broadly circular. Here’s one that I haven’t cropped or auto completed. Auto completing anything other than an evenly textured surface (like grass or sky) doesn’t work; it makes a mess of paving stones. So I left a black circle in the middle of the picture above. A camera with a good sensor and a nice, sharp lens, a tripod, a computer and stitching software. You don’t need super-high end camera kit. With any reasonable size sensor you’ll be building up a lot of pixels, and you’ll almost certainly be scaling down both the individual pictures and the end result just to get a manageable file size. The picture below is made of 90 pictures (5 rows of 18) taken with a 22 megapixel sensor. Allowing for a 30% overlap, that’s, potentially, a 1300 megapixel end result. I exported the images from Lightroom at slightly less than half size, cropped the image after stitching, saved the end result at around 30% size and still got a 100 megapixel end result. You’ll likely be working with narrow apertures for a super-deep depth of field. You don’t want the plane of focus (the bit that’s in focus) varying between shots else your pictures aren’t going to match up. So you don’t need to pay £1k for a 1.2 lens when you’ll be shooting at f11. A £300 f2.8 lens will work just as well. Bear in mind though, that the better the quality and the larger the file size, the more scope you’ll have for manipulating and cropping the end result. You need a tripod because camera has to stay in one place. I used a small travel tripod for a while. But I ended up buying a hefty tripod that puts the camera at head height. As well as a stable platform for your camera, life is much easier with everything at head height. And the angles you are working with make for more pleasing pictures. Your biggest challenge by far will be getting the pictures to line up. And that means investing in some specialist kit. The real problem is with rotating the camera around two axes and around the right spot in the lens. Unless you rotate the camera around the point at which light converges in the lens (the entrance pupil) your shots will all have a slightly different perspective. The photos won’t match up when you stitch them together. Even if your camera’s tripod mount is in line with the centre line of the lens (my GR‘s tripod mount isn’t; most SLR’s are) it isn’t under the entrance pupil. Which means that as you rotate the camera, the perspective of your shots move. When you tip the camera back and forth for different rows, things get even further out of whack. Worse, with most tripod heads, when you mount the camera in portrait mode (its generally easier to adjust the angle between columns than rows, so more columns is a good thing) the point of rotation horizontally and vertically is miles away from the entrance pupil. The picture below was taken with a Ricoh GR on an ordinary tripod head. You can see the stitching has gone wrong on the siding and the horizon. 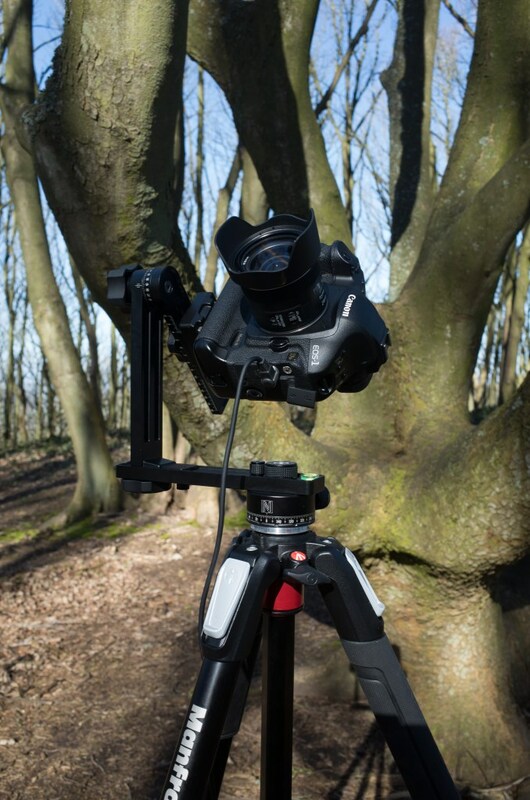 What you need is a panoramic head; the Nodal Nija 4 is a fine one. It lets you position the centre of rotation perfectly on both axes. And it’s got scales and click stops to make measuring the angles between rows and columns easy and accurate. Easier still, look up the position of your lens’s entrance pupil and set up your camera on your pano head using a ruler. I found it easier, and more successful, to work from measurements than using the trial and error manual process. You are ready to go. Here are some tips on taking panoramic pics. Aperture: Use your camera’s AV setting to set the aperture for the whole set. If the aperture varies between pictures you’ll get varying depths of field. You are using a tripod, so take advantage of that and use a small aperture to get maximum detail and depth of field. You don’t need to go to extremes, f8 to f11 is fine. Lenses perform slight less well at really small apertures. Exposure: You’ll often find widely different exposures across a view. You may go from facing into the sun to facing directly away from it. Some rows will be taken pointing at the sky, others at the ground. You can set a manual exposure for the whole set; I prefer to let the camera adjust the exposure, and then even things out in Lightroom during processing – see below. Clear evenings and mornings work well – exposures are more even as the light fades and long shadows look great. Focus: For portrait and street photography I have my camera set to use the centre focus point and to use back-button focus. I want to control exposure and point of focus independently. For panoramas, however, you’re best off letting the camera pick the focus point, and having focus and exposure on the shutter button. It’s really hard to adjust each shot individually when the camera is at an extreme angle. Let the camera do it. This works fine when you’ve got a wide lens, a narrow aperture, and nothing too close to the camera. The depth of field will be really deep and the pics will be in focus across the whole set. If you have something close to the camera you may want to calculate the hyper focal distance ( https://www.youtube.com/watch?v=tXZFnqjhNxU ) and set that manually for the whole sequence. Level: Don’t forget to level your tripod before you start taking pictures. If the tripod isn’t level your horizon with be wavy. Most pano heads have a spirit level built in. Use a remote release. Even if the exposures are short (and vibration isn’t a risk), having a cable makes using a camera on a high tripod much easier. You don’t have an awkward reach to the shutter button. Shadows: If you are out in the open on a sunny day, you and your tripod’s shadow will feature big in the foreground. I look for a shadow to hide in. Often you’ll find the shadow of a tripod leg making a very obvious straight line; you can use your own shadow to hide it.Look for interesting shadows. Trees work especially well at dawn and dusk. 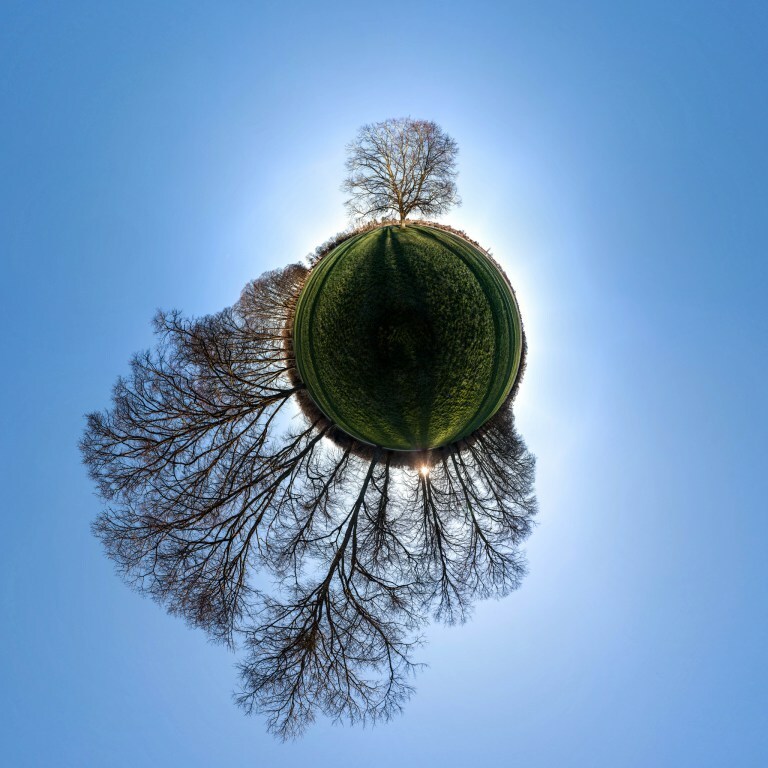 Long shadows curve around beautifully in stereographic projections. Subjects: Try the technique in places you wouldn’t normally bother taking a photo. 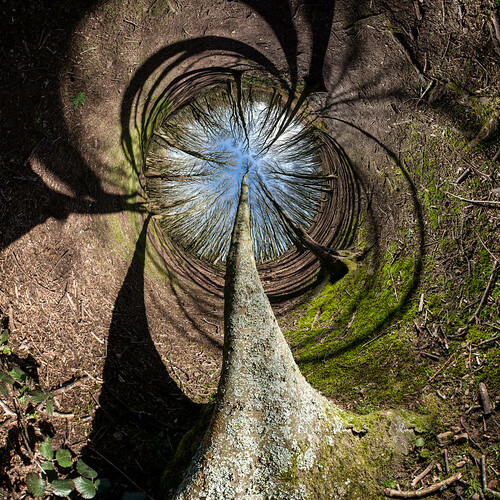 Apparently boring landscapes can come out as magical tunnels. (Conversely, some things that you think will be interesting turn out to make boring panoramas.) Like getting a new lens with a focal length you haven’t used before, it takes a while to get your eye in. 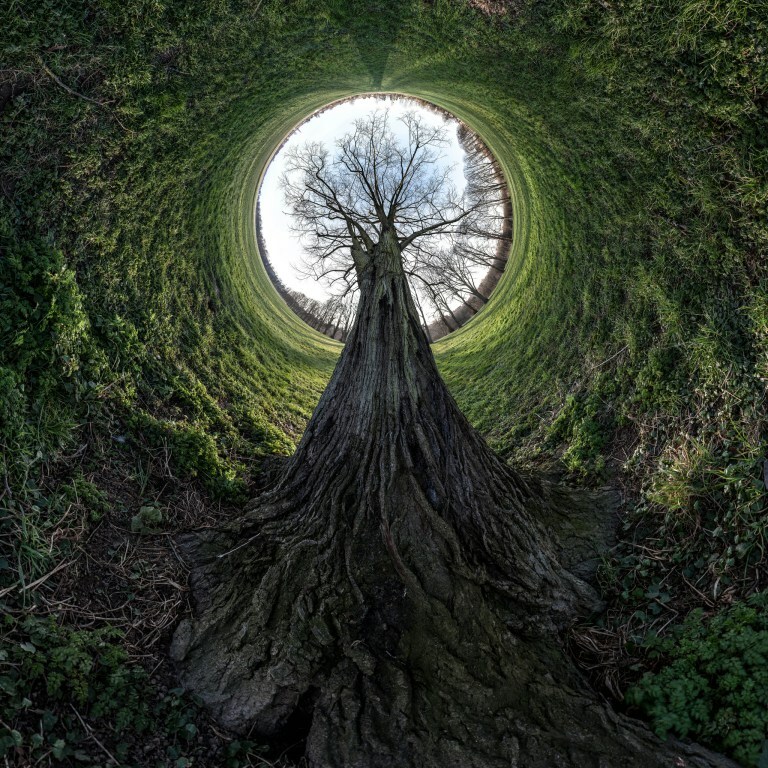 So you’ve got a camera and a pano head, you’ve taken a load of pictures… what next? Import pics from camera into Lightroom. If exposures vary across the scene (they likely will) use Lightroom’s ‘match total exposures’ feature to even them out. You can then edit subsets or individual images to get the balance you want. Open the set of images in Microsoft ICE. I’ve tried several other panorama stitching software packages on both PC and Mac; none are as easy to use as ICE. None are as flexible. None produce such good results. People seem to rate Hugin highly; I didn’t get on with that it all. Also ICE is free. Export the sticitched picture from ICE to Jpeg. Keep an eye on the image size. If you are only ever going to save to Flickr or suchlike, your images don’t need to be 60k pixels square. Even if you are printing, a 12k square pic will happily print at 30 inches square with resolution to spare. Import the end result back into Lightroom for final post-processing. 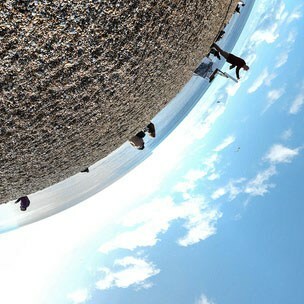 You could say that this sort of ‘little planet’ photography is more about the effect than the subject. It’s tricksy, and the pictures assembled using this trick are all about the same trick. I don’t think so. I’ve a long history of not being able to take landscape photos. It’s an art that I’ve never mastered. I can’t see a composition in a landscape reduced to 6 by 4. Stereographic projection has freed me from the letterbox. It’s a new way to see a landscape. And the result is often nothing like the landscape as I experienced it. Sometimes it’s more like a distillation of the experience. Finally, here’s a Flickr album of some worlds and tunnels I’ve made.